Great Yarmouth Central Beach01493 846346work BeachGreat Yarmouth's Central Beach is a glorious sandy beach between Britannia and Wellington Piers adjacent to Marine Parade. Full of activities for the kids and with the promenade running alongside with it's range of shops, cafe's and ice-cream vendors it makes the ideal place for the family. Ramps down to the beach are available at several locations which also allows for easy disabled access. Specially adapted beach wheelchairs are available for hire free of charge at our Tourist Information Centre located on Marine Parade so no-one has to miss out on the fun! Deck chairs are available for hire and boat trips out to Scroby Sands to see the seals leave Central Beach alongside Britannia Pier. Central Beach is home to our fireworks spectacular, held on Wednesday evenings during the summer. 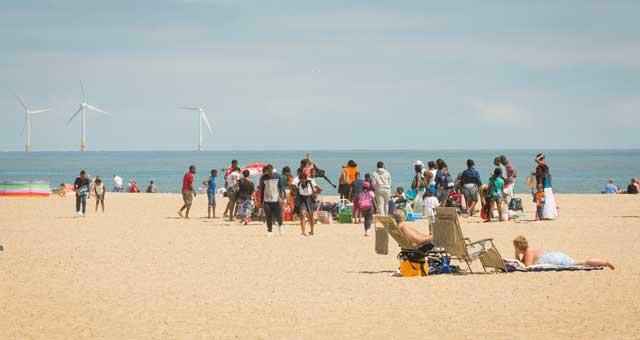 Lifeguards are in operation between April and September. Paid parking is available along Marine Parade either within our car parks or on the roadside. Public and disabled toilets are also available. 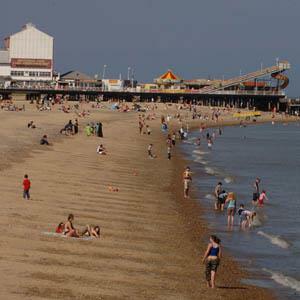 Great Yarmouth's Central Beach is a glorious sandy beach between Britannia and Wellington Piers adjacent to Marine Parade. We do ask for you not to bring your dog onto Central Beach, but they are welcome either north or south of the piers. From Norwich follow the signs and take A47 to Great Yarmouth. Once in Great Yarmouth follow signs to the seafront, Marine Parade. From Ipswich follow the signs and take A12 to Great Yarmouth, once in Great Yarmouth follow signs to the seafront, Marine Parade. Regular train service from Norwich to Great Yarmouth. Visitors should follow signs from Great Yarmouth to the seafront.